The iconic Palace Hotel of Broken Hill has come to market, boasting more sass and success than ever and Australia’s only full-time 2-up licence. The Palace is cultural centrepiece to the outback legend of Broken Hill, a leisurely 1,144 kilometres west of Sydney. The elegant three-storey brick structure stands proudly on the prominent corner of Argent and Sulphide Streets, in Australia’s only Heritage listed city. Built 1889, just six years after the founding of the town, it opened as the Coffee Palace, for the enjoyment of the increasingly high-profile and affluent visitors to Broken Hill. The design was a winning submission by Melbourne architect Alfred Dunn, and went on to earn the Palace a place on the Register of National Estates, NSW State Heritage Register, and Broken Hill’s own heritage register. As such it is eligible for heritage funding at a national, state and local level. Its most striking external feature is its two-storey cast iron balustrade veranda of more than 300sqm, reputed to be the largest of its type in the southern hemisphere. It received heritage funding for restoration and upkeep in the 1980s and again in 2012. Street level comprises foyer, front bar, commercial kitchen, a large area suitable for dining, functions and entertainment, side bar and function area, amenities, office, and a space flagged as a potential café. Upstairs there are 46 accommodation rooms, in assorted levels of refurbishment, plus a renovated manager’s residence. Central to the building is the ornate timber staircase, which continues below ground to what was the ‘gentlemen only’ saloon bar, although this lower portion of the staircase is currently closed off. The voluminous cellar contains a large historic collection of wines and spirits, accessed through an external keg drop and stairwell behind the bar. The building has a secondary internal stairwell at the rear, but also an elevator was installed in the 1980s, servicing all floors. 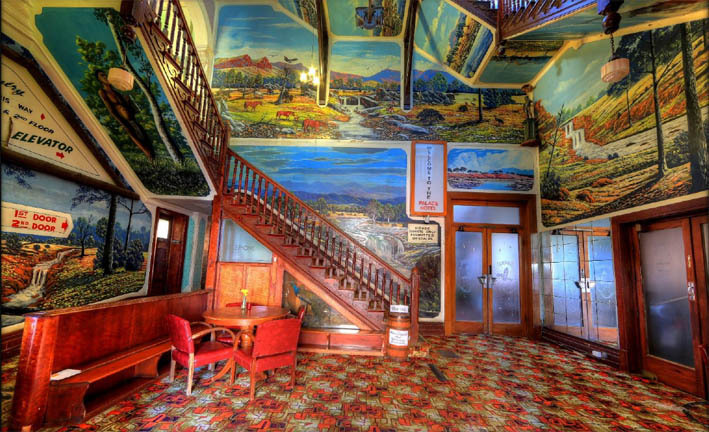 Beyond its starring role in the 1994 hit film Priscilla, Queen of the Desert, one of the pub’s most famous attributes is the 500sqm of murals that adorn the walls of all public areas, as well as the Priscilla Suite. The first was done by former owner Mario Celotto in the 80s, before unknown Aboriginal landscape artist Gordon Waye took on Celotto’s challenge to further his work, painting tributes to his homelands in Central Australia – but with water views, to meet Celotto’s wish to appear as an ‘oasis in the desert’. In 2005 the pub was inherited by Mario’s son, Marat, and in 2007 it was closed due to licensing breaches and questions over management. In 2009 it was bought by a partnership including Esther La Rovere, who has spent a decade reviving its fame and glory, along the way creating the Broken Heel Festival – three days of celebrating Priscilla and all-round fun in the desert, of which the Palace is the annual star. Enjoying regular dedicated trips by the Indian Pacific rail line, the festival has grown from 1,200 visitors its first year to 6,500 last year. The fourth instalment is set to take place in 2019, and collaboration with the event will be part of the Hotel sales process. In recognition of its national significance, Broken Hill was exclusively granted a licence to play 2-up all year ‘round back in 1992. In 2015 this one-off licence was awarded to the Palace, and a regular game takes place every Friday night, and on special occasions such as Anzac Day. The hotel business reports over $52k weekly revenue (FY2018), which is up 30 per cent on the previous year. After ten years of living the outback dream and poring over the Palace’s potential, La Rovere and partners have listed the freehold going concern with Manenti Quinlan’s Nick Butler, with asking price of $3.875m (ex-gst). Above and beyond existing revenue, Butler suggests there is broad upside potential at the Palace, including the introduction of outdoor dining, continued upgrading of the accommodation, greater catering to conferences and private events, and greater marketing to international tourism and LGBTIQ tourism. While the Palace meets criteria for a ‘trophy’ asset, potentially catching the eye of a high-profile someone interested in its fame and unique place in outback pub culture, Butler says it stands on its own high heels as a great pub.